NEW! For your convenience Modern BCAA+ is now available in tablets! Modern BCAA “The better BCAA” is now available in easy to swallow BCAA tablets that you can bring with you at all times! 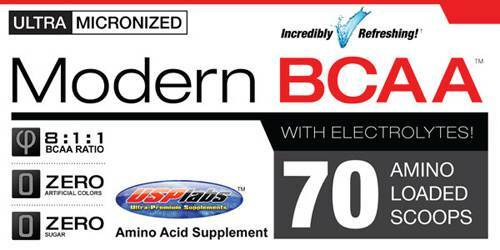 USP Labs brings you the latest in scientifically advanced BCAA: Modern BCAA, the better BCAA. You've taken BCAA before, you felt they helped you build muscle, recover faster and increase basic metabolic rate helping you in achieving a lean muscled body. You know what it means (Branched Chain Amino Acids) and you think they are all the same? Think again! BCAA is indeed the group of L-Leucine, L-Isoleucine and L-Valine, being Leucine the most anabolic/anti-catabolic of them all. Typical BCAA formulas have a 2:1:1 ratio with 2 units of Leucine for 1 of Isoleucine and 1 of Valine. Good BCAA formulas have a ratio of 4:1:1. Modern BCAA has an amazing ratio of 8:1:1 being the most Leucine-heavy BCAA formula in the market. Unlike competitor's formulas, USP Labs BCAAs are micronized, meaning they are smaller and more absorbable by the body which leads to higher efficiency, less waste and better results! To keep glutamine levels consistent, USPLabs added Sustamine® L-Alanyl-L-Glutamine instead of basic L-Glutamine, since it is a more stable and soluble delivery form of Glutamine. It also contains Electrolytes which are great for endurance sports improving you stamina and helping you to stay hydrated for longer. USP Labs Modern BCAA comes in powder form and due to the advanced micronization process it is ultra-fine and voluminous so it mixes easily without leaving a pasty residue when you finish. It is incredibly delicious and refreshing, so good you may want to drink it all the time, so no more swallowing loads of huge tablets at a time! And all of this, with ZERO artificial colors and ZERO sugar! 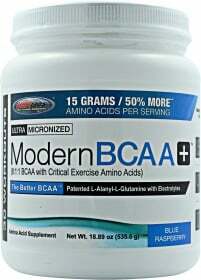 Get out of the Stone Age and welcome to the modern era with Modern BCAA! Have a question about Modern BCAA +? What is it, what does it do, how and when to use or something else? Ask us. Bcaa modern It is also effective for athletes as it works on building muscle and healing, and because the athletes are doing more effort than the effort of non-athlete, so the athlete must get an integrated source of energy. “Modern BCAA+ 150 Tabs” is currently out of stock. Enter your details below and we will let you know when it's back in stock. ALLERGEN INFORMATION: This product is produced in a facility that processes milk, whey and soy ingredients. ALLERGEN INFORMATION: Contains Soy Lecithin,Produced in a facility that also processes milk, egg, wheat, tree nut, peanut, fish and shellfish ingredients. As a dietary supplement, mix 1 serving (2 level scoops) in 600 ml (20 oz) of water and shake vigorously for 30 seconds. Sip throughout workout or athletic event. An additional serving may be taken immediately after training or any time additional aminos are needed. Using less than 300 ml (10 oz) of water per scoop and/ or very cold water can hinder solubility and cause foaming. Due to high amino acid content some initial foaming may occur, which should subside over a few minutes time with light shaking. Shake container before each use to disperse ingredients that may have settled. WARNINGS Modern BCAA + : This product is only intended to be consumed by healthy adults 18 years of age or older. Pregnant or nursing woman should not use this product. Discontinue use and immediately consult your health care professional if you experience any adverse reaction to this product. Do not exceed recommended serving. Do not use if safety seal is broken or missing. Keep out of reach of children. These statements have not been evaluated by the Food and Drug Administration. This product is not intended to diagnose, treat, cure, or prevent any disease.